I have christened the new sewing space quite successfully! 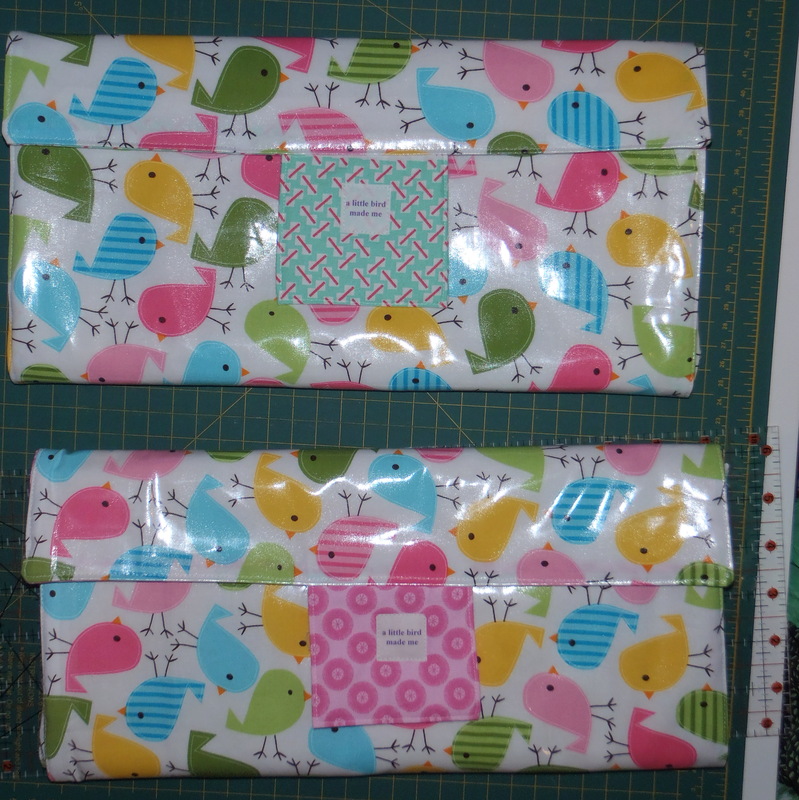 Two fold up baby change mats, on order from a friend. The space works well – not just a lovely view in the day, but good table space for cutting and piecing, so I am giving it a big tick! I do have photos to share with you as long as you promise to ignore the piles of plastic bags under the table! I have collected free fabrics through the freecycle network recently and haven’t had a chance to sort them into keepers/trash/pass-it-on, so the bags form a messy mini-mountain at the moment. The change mats are an adaptation from the tutorial I used for the last one. 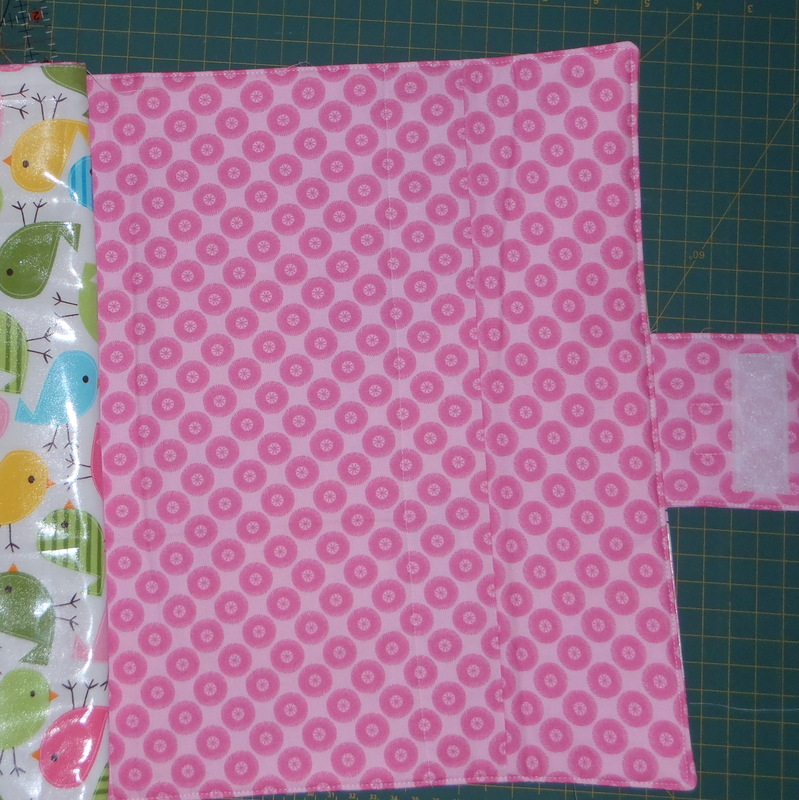 I decided that the Velcro that I put on last time, and then had to create a flap to cover to the baby’s head wouldn’t be scratched, could be improved by a different method of closure – Velcro on a flap which highlights the fabric used to line it. So here they are! The situation with the boy has not been good this week. I have had to do a lot of soul searching, research and analysis to think about why/what/how – why he is the way he is, what is best for him, what is needed, how best to support him, why he flies into these vicious rages, how to avoid them, why he is worse at school than at home, etc, etc, etc….. I think I have worked out some answers. Yesterday I took him to a naturopath who ‘tested’ him and diagnosed that he shouldn’t have any additives, preservatives, colours, or tomatoes. Now while there is not a strong science behind the ‘testing’ I am prepared to try this as it can’t hurt, and may help. Luckily our diet is pretty good due to the girl’s coeliac condition, so it won’t take a radical change to our lifestyle. I also attended a meeting with Education office and school officials today to discuss a strategy for him. For the first time I think that the school is going to be given the right support to be able to support him. I hope it isn’t a case of too little, too late, as the stress of supporting him has taken it’s toll on school staff. I am just quietly holding my breath and crossing my fingers that the plan will work, and he will be happier, safer, and calmer at school, which will allow him to learn and succeed. Little steps. Little steps. Finding more sewing projects to keep my mind busy is not hard. Today I have been continuing to cut out and piece together the fabrics to make up an order of 8, yes, 8 super hero capes. One of the capes has a request for a minecraft pick axe as the superhero emblem. I am trying to work out if I can patchwork/pixelate it! Between that and a unicorn head, an old fashioned candy and various other requests I am having fun! Photos will, of course, follow! I hope that your week is going well, and that there are bright things to balance the need for any little steps. 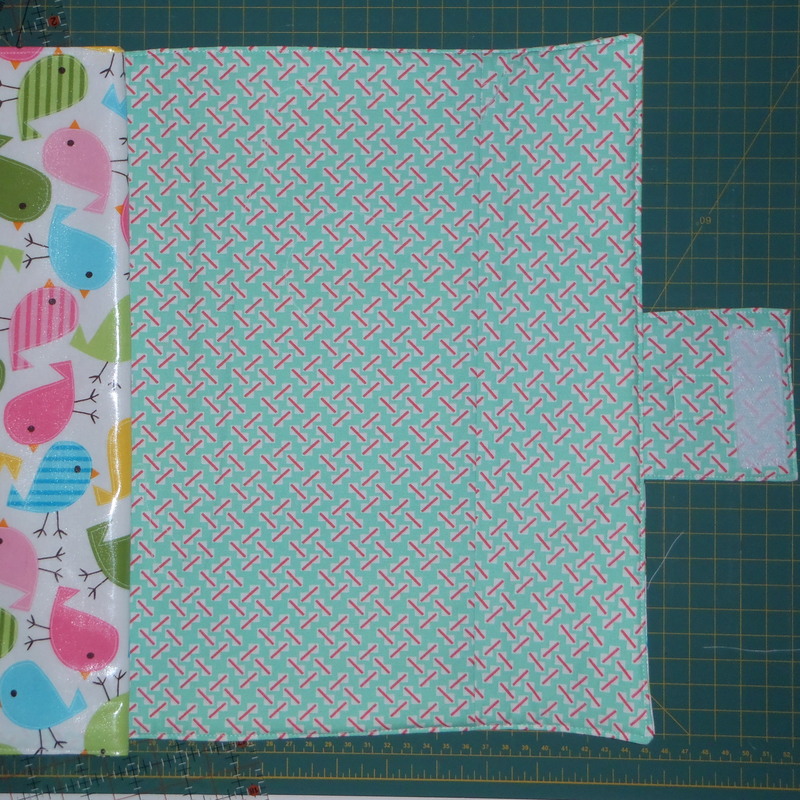 This entry was posted in Uncategorized and tagged ADHD, baby change mat, failsafe diet, freecycle, naturopath, sewing space on September 12, 2013 by a little bird made me. The changing mats are gorgeous. Sorry to hear of your little mans difficulties, I really feel for you all knowing your child is unsettled in some way and not knowing how to help must be about the hardest thing in the world to deal with. I think that anything is worth trying so hope the recommendations from the visit to the naturalist helps. Thank you Geraldine. Each day is a new day and today has started well so onwards and upwards! Oh man, I’m so sorry – major bummer about the little guy. Food allergies play havoc on people. 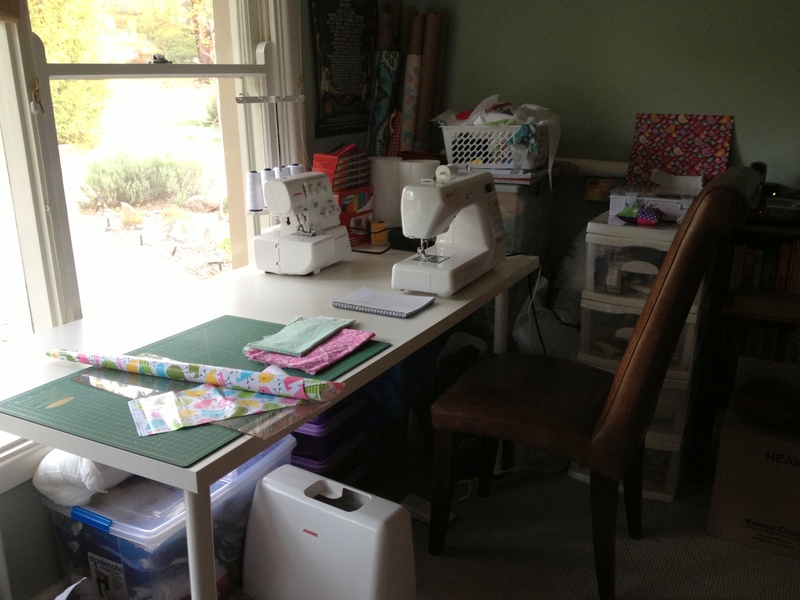 I do love your huge window for sewing! Being able to look outside seems, for me, to be something that really helps relieve stress. I agree – looking out into the garden while sewing is like a double joy! Glad the new sewing space is working out. Fingers crossed for the boy. What a great space you’ve created.. and that lovely big window! Sorry to hear about your little one.. but you’re definitely on the right track and frame of mind. Little steps, little steps.. just focus on keeping one foot in front of the other and before you know it, you’re there 🙂 Stay strong! Oh thank you Missie Messie! All these lovely bits of support and encouragement really do make a difference. 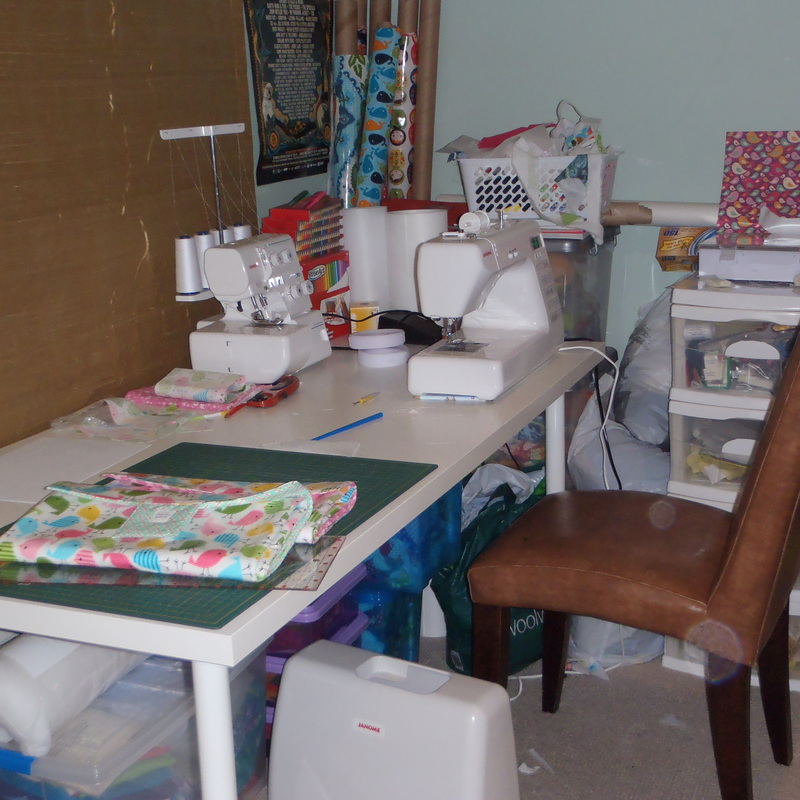 I am continuing to refine the sewing space, so hope to have photos of a tidier and more organised space before too long! Thanks Janene! I also took some inspiration from you and decided to use my camping worklight for extra light on my sewing table! Please thank your workmate for her continuing inspiration!